We all have things we like. So, I would like to hear from you as I plan for the next few weeks and into 2019. What type of articles/videos/podcasts are helpful to you? Simply email me. I am listening. Have a great day! Wharton, MIT, and London Business School studies find that laughter, big or small, have benefits that include relieving stress and boredom, boosting engagement and well-being, and spurring not only creativity and collaboration but also analytic precision and productivity. There is also a physical benefit that leaves you with a great feeling. Language matters. Horst Schulze, founding president and former CEO of Ritz-Carlton, understood the power of words for team unity and onboarding new hires. This approach became an identity branded the Ritz style. The simple approach became how Horst built a business that valued both team members and guests. Self care can appear boring. However, it requires discipline to do something you need to do versus the thing that feels good in the moment. When you truly care for yourself, you are actually in a much stronger place to give of yourself to those around you along with a host of other benefits. You know her as being an Olympic gold medalist in gymnastics. At the 2012 Olympic trials, on her best event - the uneven bars - something bad happened. She fell flat on her face. Literally. She got back up and was determined to finish on her terms. After the worst routine of her life, she received a standing ovation. She was able to rebound from a moment that was embarrassing and potentially career-ending. It had everything to do with how she chose to think. Saying 'please' and 'thank you' give Chick-fil-A a competitive advantage. In fact, they have been given the award of the most polite chain in the restaurant business. The other thing in their corner is smiling at their guests. It's amazing how being nice pays off for a remarkable guest experience but also how it positively impacts profits. Many studies over the last ten years consistently find that those who count their blessings tend to be happier and less depressed. In a recent study, individuals receiving counseling for depression and anxiety were split into three groups. The results are once again reaffirming how powerful gratitude is to the brain. A small team of people with a new idea that is not understood by those around them is the story of innovation. Many organizations tweak things but thinking differently might be the change agent for a product, team, or organization. Creating a culture that fosters innovation includes focusing on eight elements, most of which can be implemented in any organization fairly quickly. Transparency is what they want. American Airlines surveyed their employees for a second straight year. The results are astonishing. The most unfavorable results dealt with the gap between leadership and the employees running the business on the ground. However, what they discovered in the favorable results showed meaningful relationships and trusting their manager were highly rated. The point: senior leadership needs to figure out a few things. We all receive emails and phone calls from guests. Perhaps responding in a few hours is sufficient except your competitor beat you to it and the guest went with them. Harvard Business Review did a study and discovered 15 minutes was the time an organization has to respond to a guest. If you lead one person or a team of people, there is real value in asking helpful questions. The BIG question is what should you ask? 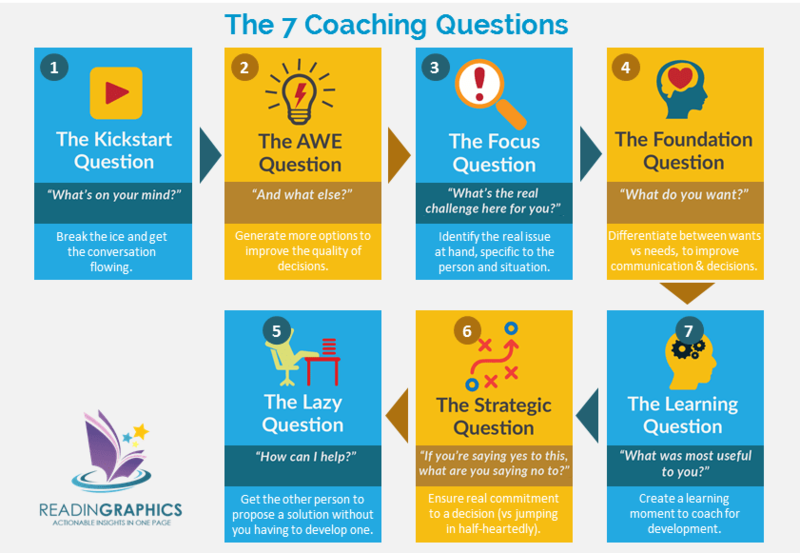 This bonus is an image that gives you seven questions (and its purpose) to use when coaching your team members.